Cyber Observer is a powerful, comprehensive and easy-to-use management solution that enables Chief Security Officers, Chief Compliance Officers and IT executives to effectively secure their organizations against cyber-threats. Developed by cybersecurity experts, Cyber Observer uses our patented core engine and Critical Security Controls (CSCs) measurements to present a clear picture of enterprise-wide cybersecurity eco-system status and preparedness at any given moment, alerting to breaches and threats as they arise and actions to be taken to secure critical infrastructures across the security eco-system. Cyber Observer automatically builds and assesses a security eco-system based on an enterprise’s existing cybersecurity infrastructure. It then quantifies baseline security and vulnerability levels in various domains and customizes Critical Security Controls to ensure continuous and robust enterprise protection. Once the existing cybersecurity eco-system is defined and in place, Cyber Observer monitors and delivers alerts regarding deviations, security breaches, potential risks and threats, in specific areas and as they relate to other systems across the enterprise. Security status across the enterprise is quantified and presented in clear, easy-to-read infographic views. 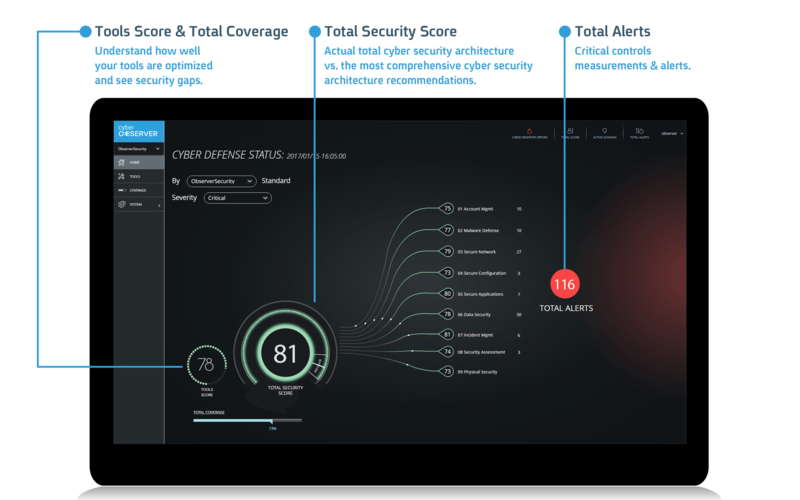 Cyber Observer not only identifies threats, but also alerts to areas of vulnerability within the enterprise which compromise its security eco-system. These can include alerts regarding improperly functioning infrastructure in the face of emerging threats, or deviations from proper security processes operation. Cyber Observer’s methodology is based on continuously implementing, retrieving and analyzing CSCs from all relevant data sources existing in the organization. CSCs are customized to meet the needs of each organization, and quantified to establish baselines for each domain and for overall security within the cyber eco-system. Cyber Observer is equipped with a distinguishing auto discovery feature that enables it to detect security and security-related tools, based on trails left by software installed in the IT infrastructure. Once discovered, they are automatically included as building blocks into the security eco-system. Suspicious activity within the enterprise leaves traces at its origin, but often affects more than one domain. Cyber Observer evaluates each domain in the security eco-system across three spheres: Technology, Processes and People. Any suspicious activity across these spheres is detected, analyzed for potential inter-relatedness, and reported.